Taguchi uses Fantastica Mania as an excuse to dress up, so he was rocking the pharaoh look. The Egyptian version, not Cody’s dog. Templarino got the honour of hitting the first dive of the tour before Taguchi reacted with horror when he had his pharaoh mask pulled off. Interestingly, that was to be it for the silliness, Ahead of his title shot Taguchi has got his wrestling boots on. The action broke down leaving our luchadores in the ring to run through some flashy roll-ups before Audaz hit a Sit-Out Powerbomb for the win. A solid opener. Forastero was introduced to the ancient Suzuki-gun tradition of jumping your opponents from behind. He took to it well. Suzuki-gun then spent the bulk of the bout foregoing tags in favour of a pack mentality. They’d swarm whoever entered the ring, beating them down in their usual horrible style. It might not be to my taste, but they are good at it. And we got a very similar finish to the last match, as Titan and Forastero were left alone after Flyer wiped out Kanemaru with a beautiful Asai Moonsault. They built to a Super Hurricanrana from Titan, but it wouldn’t be enough, and he’d end up taping to an Armbar. What can I say? It was another solid showing. Okumura and Sanson defeated Atlantis and Atlantis Jr.
Feel free to correct me, but I think this was Atlantis Jr’s debut? With that in mind, he was impressive. They protected him, limiting him to bursts of flashy offence, while Atlantis worked the bulk of the bout, but still! It was not a shabby start to his career. Outside of that, this was mediocre. While it had its moments, Atlantis and Okumura have a combined age of 102 and sequences which twenty years ago would have flowed, now chug. It wasn’t offensive, you’ll just struggle to get excited about it. Dragon Lee being here makes me sad that Hiromu is not. I want them to slap each other. Come back soon, Takahashi. It’s worth pointing out that this Mistico is not the one who worked in WWE. Confusingly, he’s actually the former Dragon Lee while Caristico, who is up next, is the former Mistico. Just go with it. With only luchadores in the ring, they got to put more of their personality into the action as this quickly became flippy boys vs powerhouses. Unsurprisingly, Dragon Lee was a highlight, but everyone looked good. There are few sights better than a great luchador in full flow. While in Ultimo Guerrero they have the ultimate showman. That bloke never fails to get himself over. The final stretch left Angel De Oro and El Cuatrero left alone to do their thing, and they looked fantastic. It’s the smoothness of the transitions that gets me. Eventually, Cuatrero hit a Sit Out Crucifix Bomb, and this was over. Easily the best match of the show so far. El Barbaro Cavenario is a flying caveman, and I love wrestling. Also, I had no idea who Namajague was until I clicked on his Cagematch profile. Probably should have guessed when he started being a nasty wee fucker to KUSHI. He looked fantastic for a guy wrestling his first match since 2013. Early on, the rudo team was doing a good job of slowing this one down. They were able to isolate KUSHIDA and go to town on him, preventing Volador and Soberano from taking off. It was a move which made it all the more exciting when they did. I know we’re five matches into a show packed with high flying, but I still love it. I’ll never tire of watching a man throw himself into the air. Sadly, just as it seemed like we were building to something, it ended. Caristico caught Volador with La Mistica and he had no choice but to tap. Fun while it lasted, but nothing special. 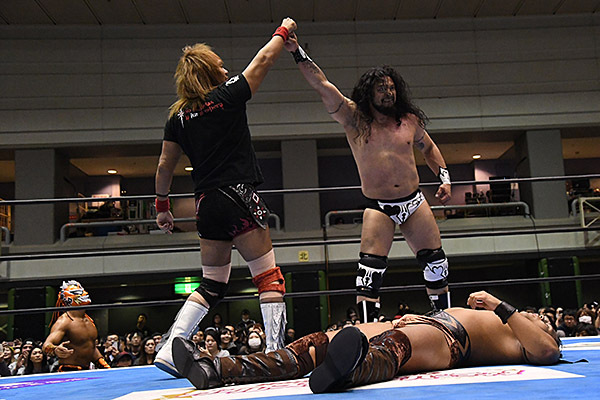 You can’t have a Fantastica Mania without the Ingobernables, and they were teaming up with the Mexican branch in the form of El Terrible. You can also continue the theme of me not recognising wrestlers under masks with Fujin and Raijin. Henare got into the lucha spirit as he pulled out a standing Moonsault. Although watching Shingo and him slap each other was even more fun than that. While it was almost like Raijin and Takagi had an established feud. That can’t be right, though. The last time Raijin worked was 2017 in Mexico, so I can’t imagine they came across each other. In fact, there were a lot of strikes in this one. Terrible seemed to be limiting his offence to punching people in the face, which got the attention of Kojima as they went at it. They have a match booked towards the end of the tour, and judging by this, it could be good fun. BUSHI would end up stealing the win with a clutch pin on Fujin before grabbing the mic and having a dig at the man beneath the mask. Truthfully, no-one was going all out here, Naito barely entered the ring, but it had its moments. A decent match to end an enjoyable show. As I said above, this was an enjoyable show. It’s Fantastica Mania, you don’t come into it expecting a great work rate. We got to catch up with some lucha friends and have some fun, I’m not going to complain about that.